Some areas of the school are available for private hire outside of school hours. We have a large multi-function hall suitable for parties, conferences and meetings. The playing fields and the multi-use games area can also be hired. We do not hire out the premises for adult parties. After reading our Premises Hire Policy below please submit the form below to request hire of the premises and we will get back to you as soon as possible. The main hall at Coldfall is a self contained extension of the school building. The outdoor facilities of the school grounds and the amenities inside the hall together offer a wide range of possibilities. There is an outdoor decking area with stunning views over Coldfall Woods. There are multiple power points, self contained toilet facilities and disabled access throughout. There is access to a serving area for light refreshments. The hall can seat approximately 200 people and is ideal for meetings and conferences. The flooring is wooden laminate and suitable for activities such as exercise or self-defence classes. 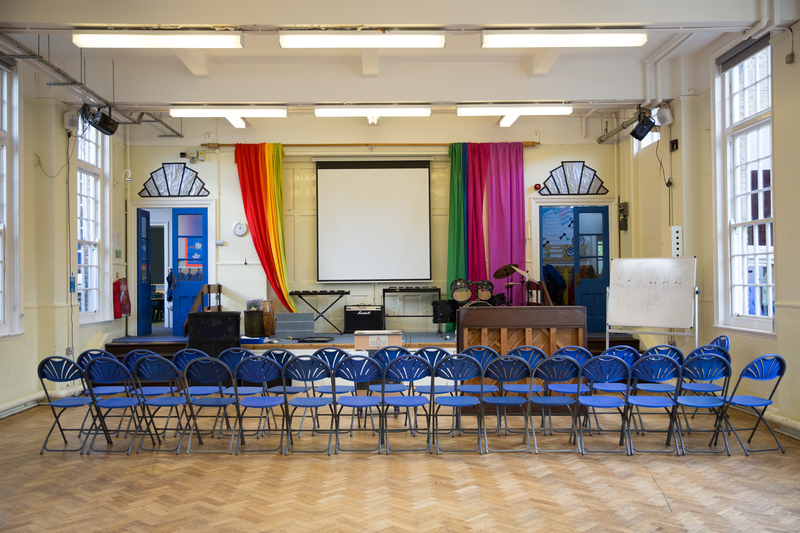 Excellent acoustics and the size of the hall make it particularly suitable for music performances, drama and dance. Coldfall’s smaller lower hall has capacity for 100 people and can also be used for sport and keep fit, meetings, conferences and children’s parties. There is a separate entrance, toilets and disabled access. The Multi Use Games Area is an outdoor astro-turf games facility located off the main field. It is has nets for ball games, and is self-contained. The school playing field is a large, grass-covered outdoor space. It has goals for ball games, and can be used for a variety of events. The Site Manager or a representative of the school will be present whenever the halls are in use and will ensure that all functions and meetings are conducted within the rules agreed by the hirer as well as providing help and advice if required. For large functions a deposit may be required to secure the letting. Deductions will be made if the hall is left in an unsatisfactory condition. In most cases a cleaning charge of £17 is applied per hire session. Very rarely an additional hourly cleaning charge of £17 may be required. The hirer must be familiar with and conform to the school’s Equalities Statement found on this website page. The hirer must be familiar with and conform to the school’s Health and Safety Policy. Lettings to bona fide community groups will be charged at cost, to cover site management, energy, wear and tear and administration. On request from the school, for extraordinary lets, the hirer will complete and submit a risk assessment to the school 14 days in advance of the date of the hire. If this is not received the hire will be cancelled. The full booking charge must be paid at least 14 days in advance of the hire by cheque payable to “Coldfall Primary School”. Any furniture/equipment required must be agreed with the site manager prior to the booking. Any movement of furniture must be undertaken by the hirer, under the direction of the Site Manager. At the end of the let the furniture must be restored to its original location. The main school kitchen is not available for hire, and therefore cannot be used by the hirer. The school has limited spaces in the school car park available for use by the hirer. The entrance to the car park is from Everington Road. No vehicles can be brought into the school playground areas except for disabled access or loading/unloading by agreement with the site manager. No alcoholic drinks may be sold without a temporary event notice available from the Haringey Council’s licensing department. The hirer is responsible for obtaining this licence, which must be presented to the site manager and prominently displayed at the event. The hirer is responsible for the protection of the premises against damage, and for the good behaviour of all associated users and will be charged for any damage incurred. The hirer is responsible for leaving the premises clean and tidy. All the hirer’s property, including decorations, must be removed after the let. The school’s no smoking policy must be adhered to at all times. There will be no access to the premises before the commencement of the booking time. Hirers must allow sufficient time for preparation before the event when booking the duration of the let. Hirers must have left the premises by the end of the booking period. Sufficient time must be included to allow for clearing away. The Site Manager acting on the authority of the Governing Body has the right to terminate any let if the terms and conditions are not adhered to. No refund will be available. The school is not responsible for loss/damage of personal belongings whilst on the premises. If the Hirer is an organisation, a copy of that organisation’s public liability insurance certificate must be provided. Individual hirers will be charged a fee of £5 per letting for public liability insurance. The Governing Body will review the lettings policy and hirers annually. Extraordinary lets or regular hirer discount must be approved by the Head Teacher. 1. The site manager must be notified of any cancellation at least 4 weeks prior to the date of let. However, notification at the earliest possible time is appreciated. 2. Where notification is given to the site manager at least 4 weeks prior to the date of the let, the booking charge will be refunded in full apart from the set administration charge. 3. Where notification is given to the school between 2-4 weeks prior to the arranged date of the hire, the hirer will be entitled to a 50% refund only. 4. Where notification of cancellation is given less than 2 weeks prior to the arranged date of the hire, the hirer will not be entitled to any refund. I have read and agreed to be bound by the standard conditions of hire attached. I am over 18 years of age. I am aware and agree that if the permission to the premises is granted, such permission shall not operate to vest in or confer upon the hirer any tenancy of or right to exclusive possession or occupation of the premises or any part thereof nor any right, license or liberty save such as is expressly granted. 1. The legal liability of the hirer in respect of claims by third parties for injuries or damage occurring during and in direct connection with the hiring up to a limit of £2.000.000 in respect of any one incident. 2. The contractual liability of the hirer for accidental damage to the premises and contents therein in accordance with the standard conditions of hire up to a limit of £5000.00 for any one incident, with a an excess of £50.00 for each and every claim. PROVIDED THAT immediate notice in writing shall be given to the London Borough of Haringey ,insurance section,10 station road LONDON N22 4TR of any damage,accident,or proceedings, and that no repudiation of liability shall be made to any third party. I agree to indemnify and keep indemnified the council from and against all loss,damages,expenses or charges which the council may sustain or incur in respect of any other matter arising out of the hiring of the premises, or the conditions relating thereto in so far as the same are not covered by the said policy of insurance effected by the council or the obligation to give notice of any accident, damage or proceedings as afore said is not fulfilled by the hirer, and to pay the council at its offices on demand all such sums as may be payable by reason of this indemnity. Use this form to make a booking request, and our site manager will get back to you as soon as possible.